Our readings this Sunday remind us of the unfathomable mercy of God. Even those who turn to the Lord at the last minute will be welcomed into the Kingdom. 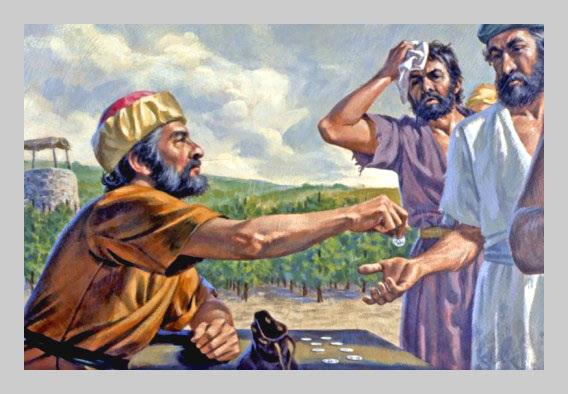 Our Gospel reading (Matthew 20:1-16) is the story of the workers in the vineyard. The master hires workers at dawn and agrees to pay them the usual day's wage. He does the same throughout the day, paying the very last workers the same as the first. This offends our sense of fairness, but not God's. Jesus told his disciples this parable: "The kingdom of heaven is like a landowner who went out at dawn to hire laborers for his vineyard. After agreeing with them for the usual daily wage, he sent them into his vineyard. Going out about nine o'clock, the landowner saw others standing idle in the marketplace, and he said to them, 'You too go into my vineyard, and I will give you what is just.' So they went off. And he went out again around noon, and around three o'clock, and did likewise. Going out about five o'clock, the landowner found others standing around, and said to them, 'Why do you stand here idle all day?' They answered, 'Because no one has hired us.' He said to them, 'You too go into my vineyard.' When it was evening the owner of the vineyard said to his foreman, 'Summon the laborers and give them their pay, beginning with the last and ending with the first.' When those who had started about five o'clock came, each received the usual daily wage. So when the first came, they thought that they would receive more, but each of them also got the usual wage. And on receiving it they grumbled against the landowner, saying, 'These last ones worked only one hour, and you have made them equal to us, who bore the day's burden and the heat.' He said to one of them in reply, 'My friend, I am not cheating you. Did you not agree with me for the usual daily wage? Take what is yours and go. What if I wish to give this last one the same as you? Or am I not free to do as I wish with my own money? Are you envious because I am generous?' Thus, the last will be first, and the first will be last." In our first reading (Isaiah 55:6-9), the Prophet Isaiah invites his listeners to seek the Lord, turn from their wicked ways; for God is generous in forgiving - beyond all human understanding. In our Epistle reading (Philippians 1:20-24, 27), St. Paul is torn between serving Christ's Church on earth and being with him in eternity. Paul shows his unshakeable faith in his "life in Christ", whether here on earth or after death. His utmost is to do the will of God. God calls us to rejoice in the mercy of God and not be resentful if someone else receives mercy. So high are his thoughts above our thoughts.